Designed as a series of satellite locations, the MSJE is currently working on two expansion sites: Meridian, Mississippi and Selma, Alabama, which both have significant Jewish histories. The sites will provide two important stops on the ISJL Cultural Corridors tour. In conjunction with the City of Meridian, the Museum will help promote the use of downtown as a historic museum and entertainment district established by the Riley Performing Arts Center. 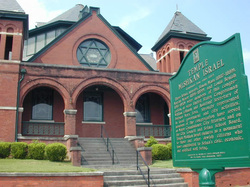 MSJE-Selma will preserve a beautiful and architecturally significant synagogue that is well over a century old. Together, the MSJE sites will further the goals of historic preservation, community building, and tourism development. Meridian, Mississippi: By the turn of the century, Meridian was eastern Mississippi’s railroad hub, a town bursting with economic activity and cultural appeal. Jews were among the earliest residents of Meridian, having moved to town after the Civil War from nearby Marion, which had been bypassed by the railroad. Meridian's Jewish community played a major role in the economic development of the city and its mark is still reflected in downtown. Several of the great downtown monuments to Jewish financial prominence still stand. Today the Marks-Rothenberg building and its Grand Opera House is the hub of downtown Meridian’s economic and cultural renaissance as the Riley Arts Center. Selma, Alabama: Jewish settlers first arrived in Selma in the 1830s and soon began holding religious services in private homes. Later, the congregation rented a local Episcopal Church for services. 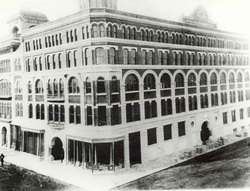 In 1899, they dedicated their first and only synagogue on Broad Street. From the late 19th century to the end of World War II, Jews dominated Selma's downtown business district and made vital contributions to civic and economic life. The Jewish population began to decline after World War II as young people left for the promise of bigger cities. The remaining Jews, mostly elderly, continue to worship at Temple Mishkan Israel today. Their devotion to preserving its legacy is anything but ordinary.